Behind your walls and beneath your floors, there is an intricate network of water supply lines, drains and vents that make up your plumbing system. Sometimes your home or office's drains clog. Or your plumbing pipes leak, freeze or burst, requiring repair or maintenance. Your water supply pipes may have problems that limit water pressure, impacting everything from the quality of your shower and the flush of your toilet to the reach of your lawn sprinkler. 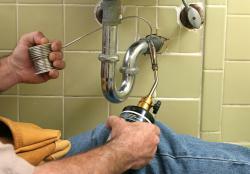 Nobody understands residential plumbing and pipe repair better than us. When we make a pipe repair service call to your home, we’ll address the problem you called about, but also diagnose any potential plumbing problems that may be lurking out of sight. You'll get the information and options necessary to prevent future problems and costly repairs. For all your pipe repair needs at your home or office, call us — the pipe repair experts — today!